Adaptive aids, then and now. Click to enlarge. 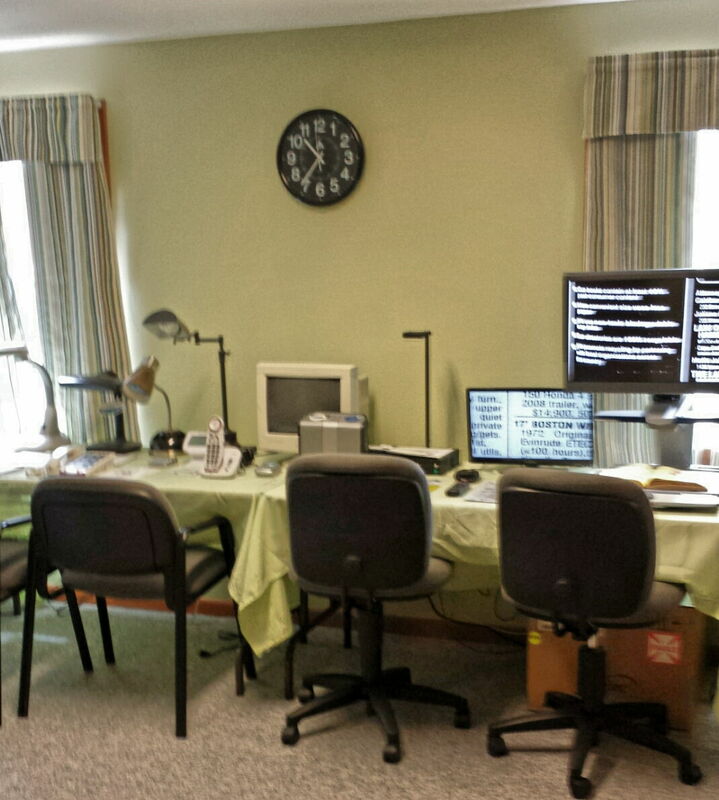 The picture above is a display we have here in the office called “Then and Now”. From left to right, take a look at how these devices have changed. There is the big yellow cassette player that the Perkins Library would send to you when their cassettes were literally Books on Tape compared to the black digital player with electronic cartridges you get now. We even have a large print insert for a rotary dial phone compared to the black-and-white high contrast stick-on buttons for a cellular phone. There is the Flash Magnifier, a 5x magnifier with a tiny bulb fitted onto a cumbersome D-cell battery flashlight compared to an illuminated Reizen 5x magnifier with a single push-button that runs on AAA batteries. There is even an enormous television remote with large buttons compared to a normal sized remote with high contrast blue buttons with Braille on them, and extra ‘eyes’ so you can hold it only inches form your face and still change the channel which comes with a stand that makes the remote beep if you can’t see where you put it down. The point of the display is that even in the last few years, the pace of adaptations and improvements has changed and picked up. There is now more research and development of devices for the visually impaired than ever before, and the time to learn about them and how to use them is while you have the maximum amount of usable vision to help you. 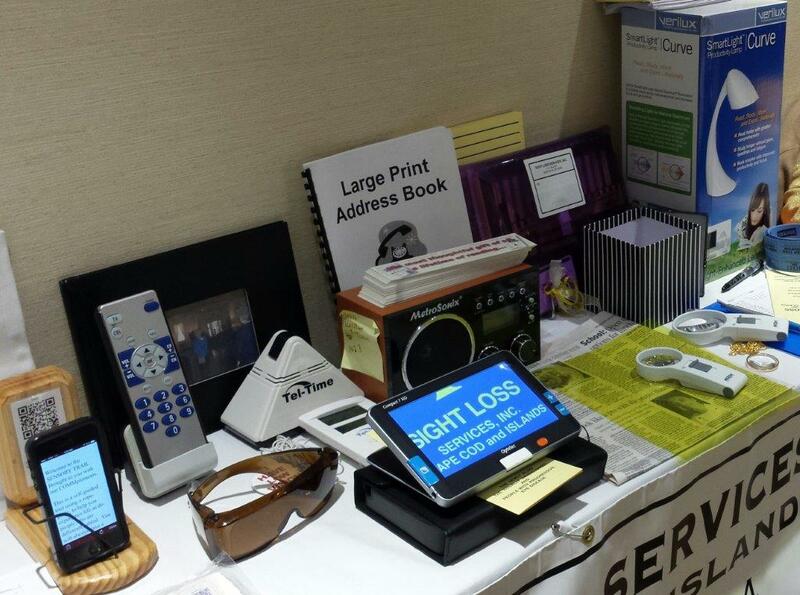 Sight Loss Services maintains a Resource Room of adaptive aids and appliances, the only such facility in southeastern Massachusetts. Our Resource Room. Click to enlarge. Nowadays, so much is online on web sites and you may not be able to see the picture associated with a product. Catalogs are printed with tiny print on glossy paper. When your vision is impaired, it is imperative to be able to touch, handle, and experiment with devices to see if they can work for you. We buy one of a lot of things so you can come in an experiment with them. We also try to keep up with new innovations and products, and we can likely inform you of devices large and small that you didn’t know existed. We strongly advise that you call ahead and make sure that somebody will be there to help you before stopping is, but we hope that you will visit us. We have many kinds of magnifiers. Click to enlarge. 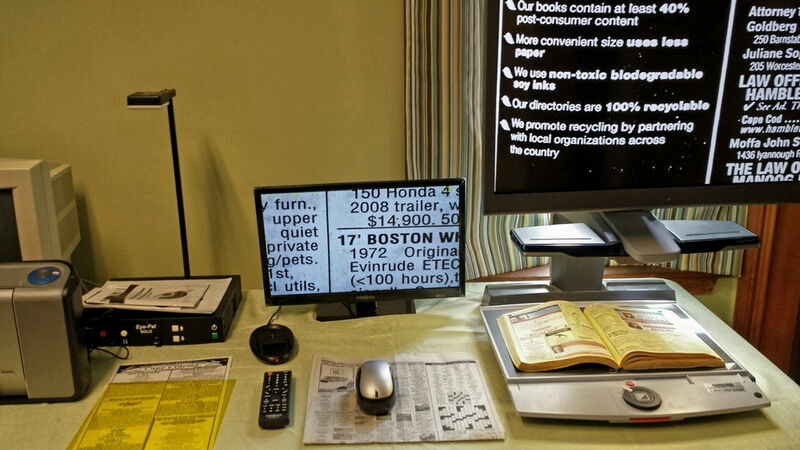 Many types of reading devices for you to try. Click to enlarge.